Tiers represent your skill level on Challengermode. The number of Tiers may vary between games, depending on the number of players. Tiers are division/segments that roughly represent a range of skill for a player in a specific game. The skill range is calculated based on games played on Challengermode (e.g. in a tournament) and relative to other players on Challengermode. There are currently 7 Tiers in LoL and 6 in CS:GO. The number of Tiers will grow slightly over time, as the there can only be a certain number of players in the top tier. Tier 1 is the lowest and Tier 7 is (currently) the highest. The Tiers are designated by Roman numerals (I, II, III, IV, V, VI, VII, VIII = 1, 2, 3, 4, 5, 6, 7, 8) etc. Based on your Tier, you can then enter into ranked tournaments with bigger prize pools and often restrictions on who can participate. This means that players in the lower Tiers will be able to play with others at the same skill level, and vice versa for high Tier players. A tournament with a Minimum Tier 1 and Maximum Tier 3 would indicate that only players who are ranked in Tier 1, 2 or 3 will be able to participate. Anyone in Tier 4 or higher will not be able to play in that tournament. Play 5 games on Challengermode to go from Unranked to getting placed in a Tier. The more you play and the more people you play against, the better the skill rating will get. So don't get dismayed if you think the Tier doesn't accurately reflect your "real" skill level, you'll likely rank up quickly again after a few more games and tournaments! Only Tournaments or Matchmaking games (challenges) will count as a "game". In other words, matches played against other players on Challengermode. 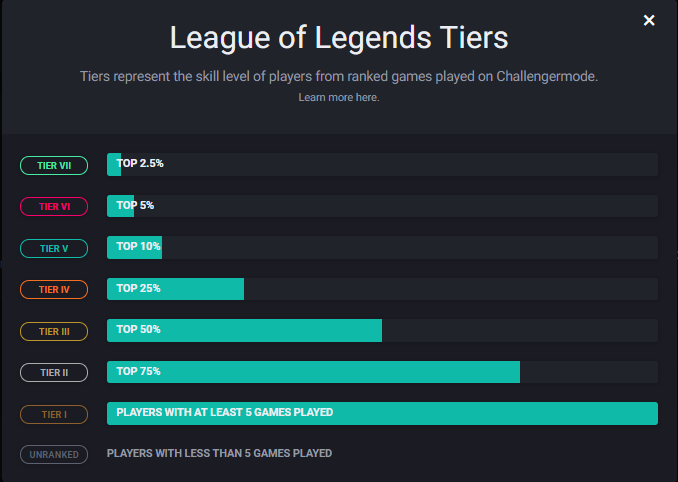 The LoL Daily Ladder or public CS:GO servers hosted by Challengermode do not count towards your Tier rank. Fairer games and tournaments: With a Tier you can enter into ranked tournaments that are only open to players/teams with a certain rank. Bigger prizes: Ranked tournaments have bigger prize pools to reward the players that invest in Challengermode and in becoming better players. Getting a rank is meant to be one step in the right direction for your esports career or goals as a gamer. I'm rank X in game Y, shouldn't I be in a higher/lower Tier on Challengermode? Your rank on Challengermode is calculated based on the matches you have played here against the players on Challengermode and may differ from other games or platforms. I'm Tier 2 and my friend is Tier 4, can we both play in a tournament for with Tier 3? Everyone in the team has to be within the allowed Tier range for a specific tournament. You can always join unranked tournaments if one of your friends or teammates can't enter. Why are there no Tiers in PUBG? Because Battle Royale games are played among multiple opponents in one game rather than head-to-head, the ranking system must designed in a different way. Tiers for PUBG will be available in the future.